For many of us, the garden shed becomes something of a dumping ground for all manner of items, from tools and gardening equipment to bikes and old cans of paint. It's therefore pretty easy for it to become disorganised and messy. So, what is the key to keeping your shed neat and tidy? The answer (probably not surprisingly) is installing the right kind of storage units. There is a staggering array of options out there, so think carefully about what you keep in your shed before you start looking for the right way to store it. Here are a few suggestions of ways in which you can organise your outdoor storage space. 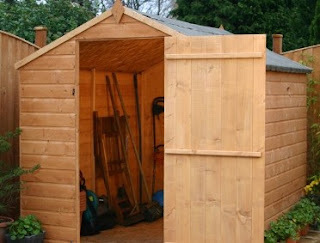 The best place to start is by looking at the size of your shed and deciding what it's practical to store in it. If you plan to use it as a workshop as well as somewhere to keep your tools and gardening equipment, make sure you allow sufficient room for this and think about installing a workbench, if you haven't already. You'll want to utilise as much of the space as possible, so think carefully about how to arrange your shelves and where you'll store larger items. Shelves are the most obvious way to organise all your belongings, but there is a host of other storage options on the market. For example, racks are a great solution for keeping gardening tools like forks, rakes and spades in order. You can buy a wall-mounted rack if you've got the room, or pick up a stand that can be positioned in a corner and hold all these items when they're not in use. Metal sheds, meanwhile, are ideally-suited to slat wall storage solutions. These are essentially grooved panels that are fitted to the inside of the shed that can then support shelves, racks, rails, hooks and other kinds of storage. They're incredibly versatile, as you can move the various shelves and things around or swap them for different options as your needs change. Buying small storage boxes for all those little fixtures and fittings like screws, nails and picture hooks is a great way to organise all your spare DIY parts and make them easy to find when you need them. If you also use your shed as a place to keep things like logs for an open fire, it could be worth looking for an alternative space in which to put them, thereby freeing up a bit more room in your shed for tools and other odds and ends. A garden log store is the perfect choice, as these are not overly large and can simply be positioned directly next to your shed to give them extra shelter. Typically, this type of product provides a covered area that will protect your wood from the elements and help keep them tidy too. Bikes are another possession that is often kept in a shed, but as these tend to be quite bulky they can take up a lot of space. Buying a separate garden storage box that is large enough for bicycles is a great way to not only move these items out of your shed, but also to keep them secure. This kind of storage product can be purchased with locks, giving you extra peace of mind that all your cycling gear will be safe when it's not in use.